Mark Rhoads is an everyman's story, growing up in rural America, paying his own way to an undergraduate degree in biology from the University of Pennsylvania and later in life completing a master's degree from the Wharton School of Business. He enjoyed a successful career in the pharmaceutical industry starting as a marketer, then a strategist, finishing his career as president and CEO of a radiopharmaceutical company. Mark recounts his journey of self-discovery through the readings and philosophies that have brought him to an everyday peace that passes all understanding. He sees this as nothing special, just simple magnificence. This peace and grace are our true nature, the right normal, available to us all if we can just remember who we already are. 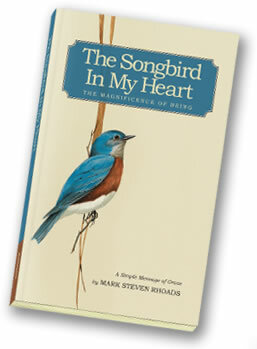 Told in poetry and prose, Mark challenges his readers to take charge of their spiritual lives, to seek out their inheritance. He does not promote any one religious or spiritual tradition, but encourages them all. Today, Mark lives under the shining blue skies of the Blue Ridge Mountains of Virginia. He continues his pursuit of everyday peace and grace in the propagation of flowers, fruits and vegetables. Everything has become more beautiful and extraordinary as each day becomes a wonderful new day of greater aliveness and presence. Your browser does not support the audio element. Please use Safari, Chrome, or Firefox. Moved to a new distance.